I’ve been a professional speculator in the resource industry for almost two decades now. At the January 2018 VRIC, which is cohosted by Katusa Research and Cambridge House, I invited out the most followed guru in the crypto space to give his take on where the crypto world is going. Even though I published my thoughts that the price of Bitcoin and the whole sector as a whole was in bubble territory, I kept an open mind. My goal was to create a forum of positive debate between the crypto world and my world. The debate has been viewed over 100,000 times and I did my best to create a fair debate. This past week Bitcoin fell below $4000, down a whopping 70% year to date. But this isn’t a bash piece. I’ve been watching Bitcoin develop since 2010. I even told my good friend and business partner Doug Casey that it had the potential to change SWIFT (Society for Worldwide Interbank Financial Telecommunication) in an internal memo while we worked at the same firm back then. Yes it’s true, I introduced Bitcoin to the Casey Research world in early 2010. As with any new sector, there are going to be mega highs and mega lows. The key is to not buy into the hype at the top and blow yourself up. Unless you’re an ultra-early adopter it’s always better to let the market implode. And then pick up pieces of the remaining businesses at fractions to what they were trading at during the boom. It is the Way of the Alligator. So What Do I think will Happen to Bitcoin and Cryptocurrencies Now? You will see more downside pressure as the Uncle Sam comes after his due taxes and accounts are forced to sell to pay the tax man. There will be attempts to rally the price, but there is still a lot more cleansing to happen. We have not seen the bottom in Bitcoin. Veteran investors from the dot-com crash or the resource sector have seen this game before. The dot-com bubble of the late 90s played out exactly the same way. Hundreds of companies rode the soaring wave of investor sentiment in order to cash in on the hysteria. Hysteria can only support valuations for so long, and eventually fundamentals take over. The collapse of the technology sector resulted in many businesses being put to the test. Were their business models capable of sustaining themselves without the hype to prop it up? For many companies, the answer was no. Over 75% of tech companies founded during the bubble went bust. However, from the ashes of the dot-com bubble would come some of the most recognizable names of our time. Amazon, Google, eBay. Many of the most familiar household names today not only survived the crash, but came out stronger for it. 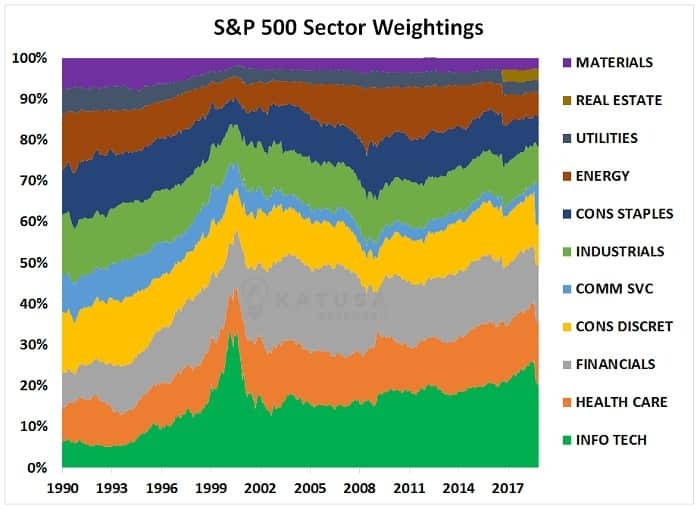 The chart below shows how the information technology weighting of the S&P 500 has grown to the point where it once again comprises a quarter of the S&P 500 index by value. This is close to where it was at the height of the dot-com bubble. The moral of the story is this. After all the hype and mania is gone, the right companies will still be left standing. And they will be thriving. And I foresee similar things happening in the crypto/blockchain space. One individual I’ve watched the last 24 months is Michael Gokturk. Michael has created two successful fintech companies in his past, and Einstein is his third. He and his team have created the largest token exchange in Canada to buy and sell not just Bitcoin, but dozens of coins such as Ethereum, Litecoin, Ripple etc. But that alone isn’t why I am mentioning him here. I want everyone to take a look at what he is doing to position his company for the next leg of the market, and I think it’s a big and potentially revolutionary opportunity. Here is my recent Q&A with Michael Gokturk, co-founder and CEO of Einstein Exchange, which is a digital currency exchange. 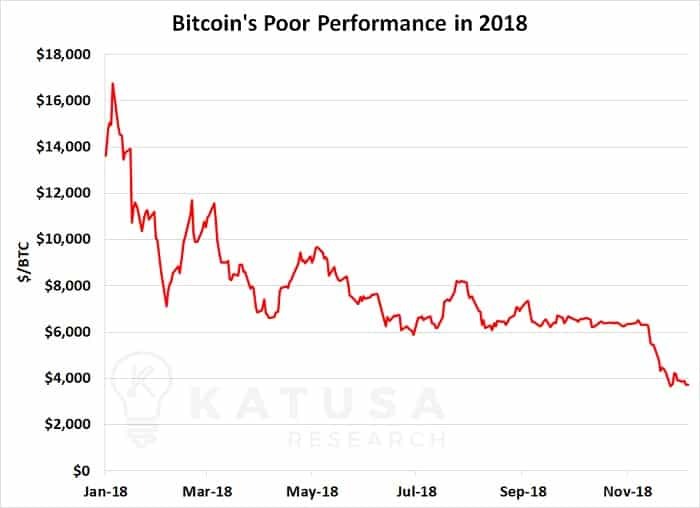 Katusa: Michael, do you believe we have seen the lows in Bitcoin? Gokturk: Bitcoin has only been on the market for almost a decade and in that short period, has been presumed “dead” by financial analysts and naysayers over 328 times, and still counting. It is impossible to predict the bottom of any asset’s value but we must remember that the value of Bitcoin has gone from $0.003 in the early days to over $20,000 in 2017, about a 6,600,000% increase in value, so some profit-taking is to be expected. Adding to the sell-off is the overall economic outlook around the world in the equity and commodity markets, which causes more panic-selling and less buyers to soak it up due to the small market size in Bitcoin. Katusa: Tell me about the trading volumes as of late? Where are you seeing both the selling coming from, but more importantly, the buying? Is the selling retail? Is the buying Institutional? Gokturk: At the height of the Bitcoin market, all exchanges combined transacted about $70B in a single day (November 30, 2017). Today, despite the market growth in new customers and new exchanges, we’re seeing less than $15B per day. That is almost 80% less activity from the high. However, we continue to see a rise in new customers on a daily basis despite the current market. Many of our newest customers are coming to Einstein to invest in cryptocurrency for the long run, not to actively day-trade. We have also picked up a lot of new institutional business during this period, all of which are buying currently. The selling is to be expected – from profit-takers in retail and institutional, to Bitcoin mining companies that need to sell to pay expenses. Katusa: How is Einstein Unique? Gokturk: Einstein was the first cryptocurrency exchange, besides Coinbase, that had approval to enable our customers to fund their accounts with a Visa or MasterCard. As a result of our past relationships, we were able to secure a working relationship with the card associations and banks to ensure we delivered on our promise of making Einstein a safe and secure means of getting into Bitcoin, and getting out if you decided to sell, and actually getting your money back into your pocket. We have a strong understanding of the financial mechanisms required and deep relationship in Canadian and U.S. financial markets. We also started Einstein with an emphasis on transparency and regulatory collaboration. This means we had the benefit of having a “fiat-to-bitcoin-to-fiat gateway” that no other exchange in the world could match. We are also still one of the only exchanges that welcome customers in our office in-person, providing a level of comfort and confidence that we are indeed here with them 24/7. Katusa: Other than Markus Frind (founder of Plenty of Fish), I have never seen an entrepreneur create over $60M in revenue within 12 months of start up with only one capital $2M raise. (Open Disclosure: I invested and own about 5% of Einstein. Everything starts with people in my investment framework and I believe in Michael Gokturk’s ability to do something incredible in the fintech space). Michael, how are you positioning the Einstein Exchange to grow in what I believe will the second leg of the blockchain revolution, or let’s call it Blockchain 2.0? Gokturk: The cryptocurrency market itself is still very small. Estimates put the number of active Bitcoin wallets around 50M. If we lump in the other cryptocurrencies like Ethereum, Litecoin, Ripple (and over 2,000 others), we are still under 100M. It took Facebook over 10 years to go from 100M to 2B users, and Amazon over 18 years to get to 300M customers. 8 out of 10 people still don’t know what Bitcoin is or how to use it. This small market, combined with a lack of knowledge, points to the fact Bitcoin is still relatively underappreciated because the everyday customer does not find real-world value or utility in it. In order to increase the total addressable market of Bitcoin from under 100M to over 1B, there has to be a significant catalyst to ignite such a step change. We are currently working on Einstein 2.0, which I am confident will be that catalyst. We’ve been in financial technology start-ups before, and we’ve seen trends of commissions or fees being a race to 0. In brokerage, in payment processing, and now in virtual currency, we’ve seen high fees in the infancy of the market decline by up to 99% as new entrants enter and margin compression becomes inevitable. At Einstein, the majority of our revenue comes from credit-card based sales of any cryptocurrency we carry – still a major competitive moat – with margins 30x higher than trading revenue. Now we seek to expand that moat by enabling more purchase options such as American Express, UnionPay, Interac and alternative payment options such as Skrill & Neteller. However, this doesn’t solve the small market problem. For this, we have a much more elegant solution… offer more relatable products to exchange on our platform: loyalty & rewards points. Katusa: The royalty reward sector is what really gets me excited and will potentially make Einstein Canada’s next big fintech success. Gokturk: Me too Marin, and our team is working around the clock on this. The loyalty & rewards market is over a trillion dollar sector per year and is global. It has no boundaries and is not subject to significant regulation or scrutiny. Everyone has loyalty points of some sort, and our data shows that over 59% of loyalty points are unused or unclaimed. In the U.S. alone, there are 3.3B loyalty programs (that’s 29 per household) and less than half are actively used. Conceptually and technically, a loyalty point is just the same as cryptocurrency. It is a digital store of value, it can be transferred or consumed relatively easily, and has value to the issuer and to the consumer. Lost or misplaced Bitcoin hurts the market by constricting supply, lost or unused loyalty points hurts the issuer (i.e. TD Bank who issues Aeroplan) by burdening the balance sheet of the issuer. Our exchange serves as a matching engine, which essentially enables a holder of one type of loyalty point (i.e. Aeroplan) to buy another loyalty point (i.e. Airmiles) from the holder of Airmiles. Same concept as the peer-to-peer Bitcoin to Ethereum transaction that we facilitate today. Accordingly, by adding another type of digital asset to our platform, we open our addressable market from less than 100M potential customers to over 2B around the world – and best of all – it is free to open an account with Einstein, and it is free to convert points into another point, into cryptocurrency, or into cash issued to a Visa card on your mobile phone. Katusa: I think in 2020-2021 the word “unbounding” the balance sheet will be a hot topic. As interest rates rise, the cost to borrow will increase for all companies. Unbounding is taking liabilities such as reward loyalty points off the balance sheet so borrowing money costs less. This is such a novel business plan which gets me very excited. It’s very early days, but I think Einstein has all the variables to be a real winner, not just for shareholders but for users. Check out their site here. We all have them, loyalty reward points that are doing nothing for us. Finally, an app that takes those points and converts them to profits. No risk, no hassle. Sure beats taking on any risk in these markets. Open Disclosure: I invested in and own about 5% of Einstein. It is a private company.